E-vites are out!! Thanks, Tanya Smith at Tanya Design + Photo, for this beautiful artwork you created. 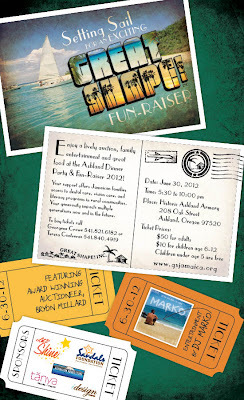 We’re excited to see you at this year’s Ashland fundraiser to benefit our families in Jamaica. This year’s headliners: an auction featuring award-winning auctioneer, Bryon Millard, music by DJ Marcos, stories by Let It Shine Media, and “merry-time” ambiance by iDesign! Also, please give HUGE thanks to the Sandal’s Foundation! On top of the amazing support they consistently provide, this year they have provided YOU with the opportunity to win a trip to Jamaica! It’s Shaping up to be a Great time with Great Shape! We hope to see you there! Previous post A New Van! Next post iCare Donation!